Have you seen the second episode of “The Highland Woodworker” yet? If you haven’t…then I should’ve posted this much earlier! In this, the second installment of the show, host Charles Brock takes us on a trip to visit with famed chair maker Brian Boggs. Charles and Brian have a great conversation about Brian’s early days in both woodworking, along with a look at Brian’s studio and workshop in a segment of the show called Moment with a Master. 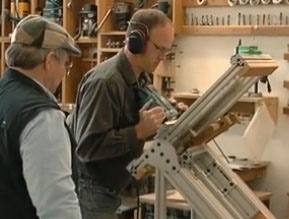 And if that weren’t enough, Charles visits with Hand Plane Maker Ron Brese of Brese Planes. The level of quality, detail and accuracy of Ron’s planes are only rivaled by their beauty. Of course there’s more on the show than these two segments to keep your interests piqued. From tools to finishing, there’s something for everyone. Visit The Highland Woodworker website at www.thehighlandwoodworker.com to sign up for the newsletter so you’ll stay informed of the next episode. Winter Festival at Highland Woodworking? On the topic of his pegged MTs… I don’t get why he wouldn’t go ahead and drawbore the pegs. Is there a time when you wouldn’t want to add the extra mechanical strength to the joint? I cringed a little too, but them remembered I think that’s how do it all the time too lol! As for drawboring vs glued it’s the same destination, just different routes to get there as far as I’m concerned. The only advantage I can see, is that the drawbored peg doesn’t rely on the glue for holding power. But to be sure, I asked Matthew if he’d be willing to respond also. Thanks. Your comment about carving the pegs cracked me up. My first intro to woodworking was carving or, as it might more accurately be called at that stage, whittling. I started using that particular knife years ago when I was way too young to have a knife of any kind in my hand (Thanks Dad) and it always made my mother cringe. I’m sure it still does. But once you’ve done a little carving you get a feel for it. Don’t get me wrong, I wind up with nicks and cuts as much as the next guy, but it’s been a while since I’ve cut myself carving a peg–you just can’t use too much pressure or try to remove too much material at once. It is safer to carve away from you, of course, but you give up a lot of control. As for drawboring. . . well, no, I can’t think of a time when drawboring wouldn’t be better in many ways, but it is a little more work and it’s not always necessary.I’ve seen joints that weren’t pegged at all that are still together after a few hundred years. And of course I’ve seen pegged ones that are still together after the same amount of time. . . drawbored and otherwise. But, yes, a pegged mortise and tenon is usually stronger than an un-pegged one, and a drawbored peg is usually stronger than a regular pegged joint. But drawboring reminds me of dovetailing; dovetails are the strongest corner joint I can think of, but not every corner joint I’ve ever cut has been dovetailed. Thanks again for the comments. And don’t worry, I’ll watch out for my thumbs. Thanks Matthew for the response! Makes sense… in some cases it would just be overkill. « Lee Valley has Free Shipping for a limited time!